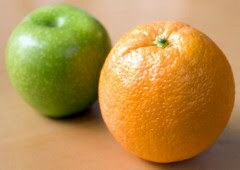 We had an incident the other day about a VirtualCenter v2.5 U4 not showing performance statistics for the VM's. It was possible to see live stats for e.g. CPU and memory usage. But changing the chart options to 'weekly' or 'monthly' resulted in a 'Performance data is currently not available for this entity'. Recently the backend SQL Express server for this VC had been upgraded to a SQL 2005 Standard edition and this was the reason for the error. After adding the jobs and waiting a couple of hours for all of the jobs to have run, everything worked just fine (The VC DB is called VCDB - UMDB is for Update Manager). Howto: Removing a disk from a VM - howto identy the right disk? 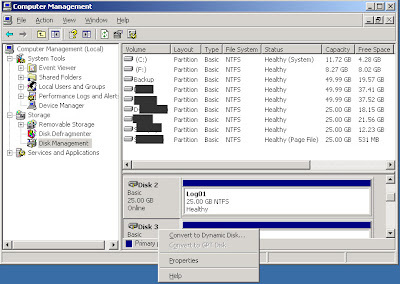 From time to time, we need to remove disks from a VM. 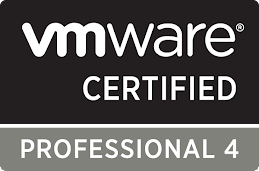 If there's only two or three disks attached to the VM, it's typically not a problem figuring out which one to remove e.g. if the disks have different sizes. But if you have seven or eight disks and they are the same size, then it's a bit more tricky - let's say if you're asked to remove the 'E-drive'. 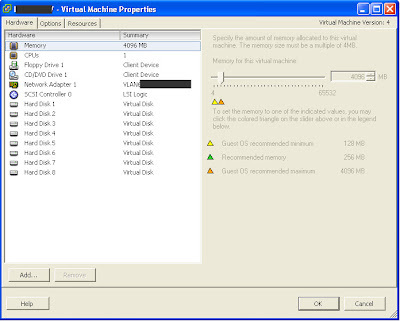 Under 'Edit Settings' for the VM, the disks only have a number which does not necessarily correspond with anything within the VM. So how to identify exactly which disk that corresponds with a given volume within Windows? 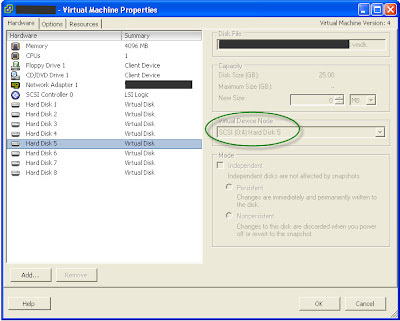 The match can be made by looking at the SCSI target ID for the disk - this can be identified both in WIndows and under 'Edit settings' for the VM (A VM can have four SCSI controllers with up to 15 disks on each controller, so a maximum of 60 disks per VM). 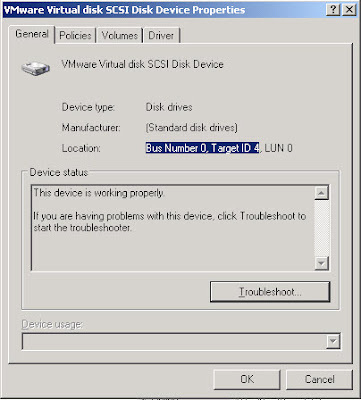 On the General tab you will see the Bus number (SCSI controller) and the Target ID (SCSI target ID), note the number - in this case below the ID is 4. Now go to 'Edit Settings' for the VM under and locate the disk with the corresponding target ID (see Virtual Device Node for the disk). Make sure the that the controller number and SCSI ID is the same. In this case it is Hard Disk 5 that have SCSI ID 4. Shut down the VM to remove the disk. It's absolutely a 'must have' tool for daily operations of the virtual infrastructure. Go here for installation guide.